Fast Radio Bursts present one of modern astronomy’s greatest mysteries, what or who(!) in the Universe is transmitting short bursts of radio energy across the cosmos? Manisha Caleb, a PhD candidate at Australian National University/Swinburne University of Technology and the ARC Centre of Excellence for All-sky Astrophysics (CAASTRO), has confirmed that the mystery bursts of radio waves that astronomers have hunted for ten years really do come from outer space. Ms Caleb worked with Swinburne and University of Sydney colleagues to detect three of these Fast Radio Bursts (FRBs) with the Molonglo radio telescope 40 km from Canberra. Discovered almost 10 years ago at CSIRO’s Parkes radio telescope, Fast Radio Bursts are millisecond-duration intense pulses of radio light that appear to be coming from vast distances. They are about a billion times more luminous than anything we have ever seen in our own Milky Way galaxy. 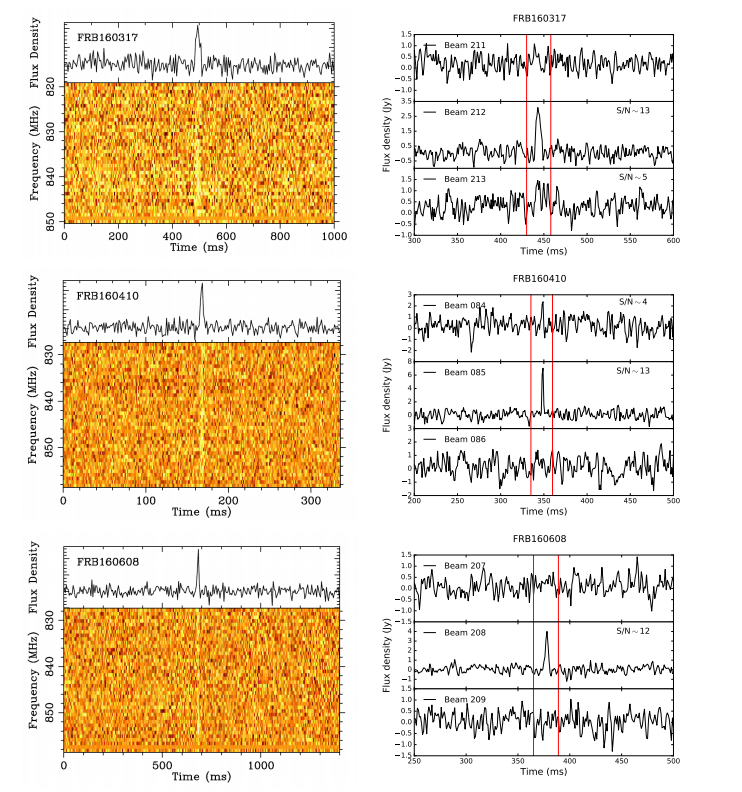 The profiles of the 3 radio bursts are shown at left as a function of the radio frequency of detection, and at right as a function of time for nearby locations on the sky. The presence of the bursts in just 1 or 2 of these adjacent locations demonstrates they are originating from more than 10,000 km away. Figure from the paper by Caleb et al 2017. One potential explanation of the mystery is that they weren’t really coming from outer space, but were some form of local interference tricking astronomers into searching for new theories of their ‘impossible’ radio energy. “Perhaps the most bizarre explanation for the FRBs is that they were alien transmissions,” says ARC Laureate Fellow Professor Matthew Bailes from Swinburne. “Conventional single dish radio telescopes have difficulty establishing that transmissions originate beyond the Earth’s atmosphere,” says Swinburne’s Dr Chris Flynn. In 2013 CAASTRO scientists and engineers realised that the Molonglo telescope’s unique architecture could place a minimum distance to the FRBs due to its enormous focal length. A massive re-engineering effort began, which is now opening a new window on the Universe. Ms Caleb’s project was to develop software to sift through the 1000 TB of data produced each day. Her work paid off with the three new FRB discoveries. 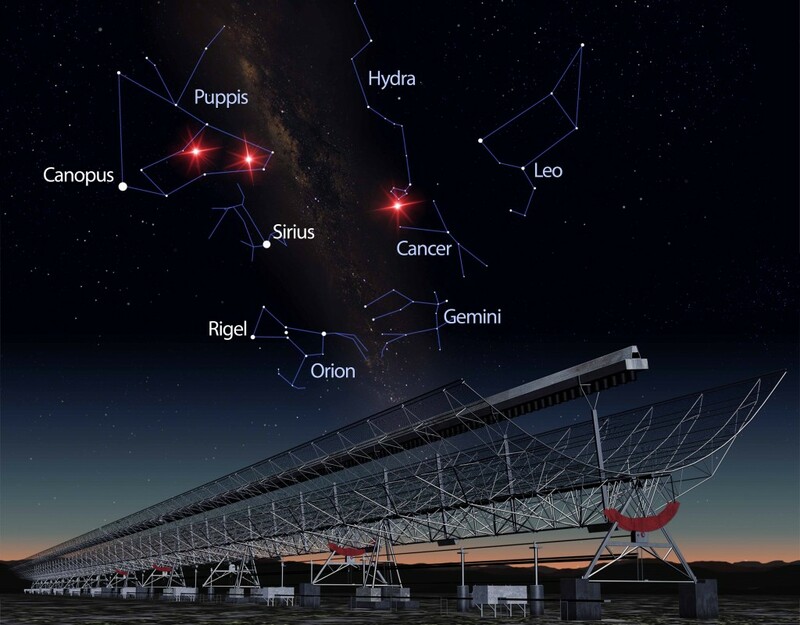 “It is very exciting to see the University of Sydney’s Molonglo telescope making such important scientific discoveries by partnering with Swinburne’s expertise in supercomputing”, says Professor Anne Green of the University of Sydney. Over the next two years the telescope will be improved even more, thanks to further funding from the Australian Research Council, gaining the ability to localise bursts to an individual galaxy. 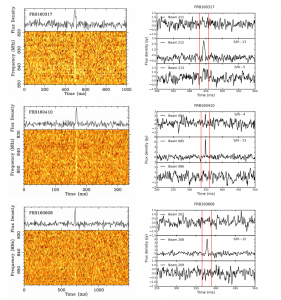 A paper on the discovery “The first interferometric detections of Fast Radio Bursts” has been accepted for publication in Monthly Notices of the Royal Astronomical Society.